Risotto is one of my favorite dishes to prepare, & it’s been a while since I’ve slaved over the stove to make it! When I saw this member submitted recipe in my CSA’s newsletter, I had to try it, with a few modifications, of course. I am always looking for new ways to use beets & I’ve never tried a risotto that I didn’t love! This one was no exception! The sweet golden beets & rainbow chard impart a healthiness to this rich & buttery dish! Bring stock to simmer on stove. Heat the oil in a wide pot, add onion, and cook over medium heat 3 minutes, stirring frequently. Add the rice, stir to coat it well, & cook for 1 minute. Add the wine & simmer until it’s absorbed, then stir in the parsley, the basil, grated beets, & chard. Add 2 cups stock, cover, & cook at a fast simmer until stock is absorbed. Begin adding the remaining stock in 1/2 cup increments, stirring constantly until each addition is absorbed before adding the next. When you have 1 cup left, add the beet greens. When all liquid is absorbed & the rice al dente, add vegan margarine & nutritional yeast. Taste for salt, season with pepper, then stir in the lemon zest & juice to taste. Top with chopped parsley & a chiffonade of fresh basil. So, with glass of wine in hand, let the stirring begin! 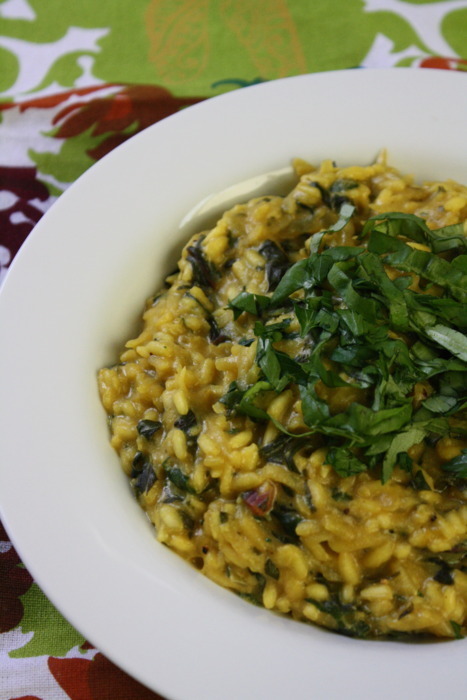 If you love beets & risotto like I do, then this recipe is worth the effort! Enjoy! The Vegetarian Flavor Bible Review & Giveaway!